A drawing of a young man, seen from the front, striding half to the left, with his head turned to the right. He wears a masquerade costume, a cap with a feather and a beribboned doublet, with flowing sleeves. His left hand is on his hip, and in his right hand he holds a lance. 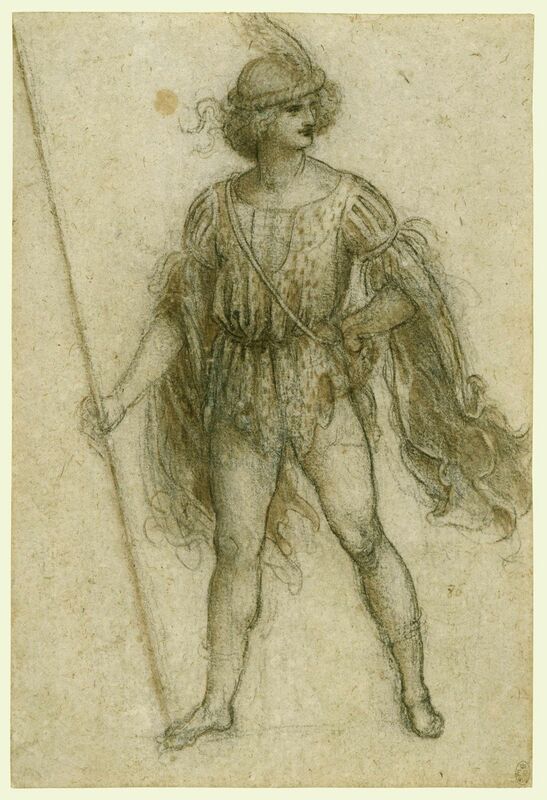 This drawing by Leonardo da Vinci (1452-1519) can be dated to his last years in France, in the service of the young King Francis I. This was a period of extravagant festivals at the French court; detailed descriptions survive, by the Mantuan secretary Stazio Gadio, of the entertainments held in January 1518 in honour of the young Federico Gonzaga of Mantua, then completing his education at the French court, and in May of the same year to celebrate both the baptism of the Dauphin and the wedding of the king's niece Madeleine de la Tour d'Auvergne to Lorenzo di Piero de' Medici, Leonardo's patron three years earlier in Florence. This richness and layering of textiles is exactly what Leonardo was aiming at in the present drawings. The use of particoloured material was decorative but also carried a loaded meaning - striped, checked and scalloped clothing was associated with the German and Swiss lansquenets then employed as mercenaries throughout Europe, with fools, minstrels and prostitutes. The dignified guests of Francis I were thus dressing up not just exotically, but in something equivocal and even a little risqué.